At the start of a new calendar year, I take time to reflect back on my successes and failures of the previous year and I think about what I did or didn’t do to get to those outcomes. One thing that I sometimes overlook is relationships. How did the status of my relationships impact those failures and successes? You have probably heard people talk about being in the zone. Whether it’s sports, business or personal; being in the zone is awesome. Everything clicks, things seem easier, smoother. What you and your team can accomplish is amazing and can even be a little surprising, in a good way. But what about when we are not in the zone? When it feels like we are running in mud? When things aren’t clicking, it seems like the smallest activities are difficult and normally easy tasks take extra time. We even struggle with simple communication. 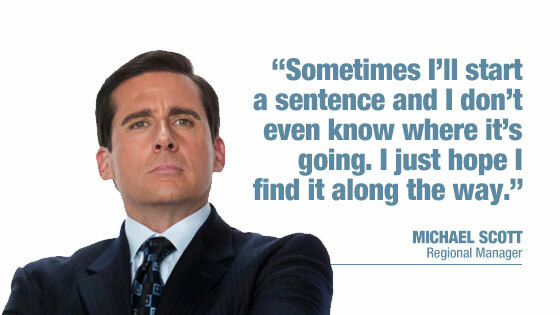 Michael Scott, from the television series The Office, sums it up well in the quote below. I think we can all agree that we’d rather be in the zone because it’s fun. Yet, because it’s fun, it can be easy to overlook important details. Details like relationships. Most of the time, relationships play a huge part in success and it is important to continue investing in those relationships. That investment could mean: communication, trust, believing the best in people, being vulnerable and transparent, asking for and giving feedback, helping others accomplish their goals, and helping others to develop and grow. These are some of the things that lead to strong, healthy, and productive relationships. But we can’t forget to be intentional about these things. At Interstates, relationships are at our core. That’s no exaggeration, our core values are building relationships through dependability, integrity, trust, quality, and family. So now that you’ve got that new 2017 calendar, I would encourage you to think of it as a fresh start. Start your year, your project, your strategic initiative, or just your day by spending a little extra time investing in relationships. That investment will pay off and could keep you and your team in the zone. That’s leading the Interstates Way! This blog post was written by Scott Peterson.